Once again the US Patent & Trademark Office has proven that its workers have too many patents to sort through and not nearly the expertise, common sense, or clear mandate to properly consider each filing. In the newest mess in our series "Patently ridiculous", Apple has finally been granted the patent for the slide to unlock gesture that is used on iOS devices. The patent, which had been filed all the way back in 2005, was issued this morning by the USPTO. It likely made it through because no one at the USPTO had ever used a Discman, or any number of laptops which also had slide to unlock mechanisms, or because once you put that same exact mechanism into software on a touchscreen device, it magically becomes unique and patentable. The extra scary thing about this patent is that while the images provided for the patent application are the standard slide to unlock seen on iOS devices, the language of the patent is written so broadly that it covers any gesture used to unlock a touchscreen device. The title of the patent is actually "Unlocking a device by performing gestures on an unlock image", so could theoretically cover all forms of unlocking including that seen in the Sense UI or on Honeycomb/ICS devices. Still, well done to Apple for taking advantage of such a broken system. We'll update you tomorrow when there is likely to be a rash of new patent lawsuits filed against Android manufacturers. Apple doesn't want competitors' money, they just don't want anyone to compete, at all. This patent war is ridiculous and limits innovation. I wish that Apple would stop finding reasons to sue Android OEMs into oblivion and actually make a device that they feel can compete, because this patent mess clearly shows that they don't. I hope this patent is ruled too general, instead it should be something along the lines to "slide to a preordained target to unlock phone". This would allow the Sense-style ring, as you can drag it anywhere on the screen to unlock. so if apple does sue htc for the lock screen what does it mean for people who have a sense 3.0 device? Shut down the Patents Office wasted so much time and money on Apple's Patents applications and approval. If Apple were a car maker nobody could built car with 4 wheels. apple pays well for these findings. patent officers are well rewarded for their comissions. its not rocket science folks. Indeed if apple were the first to market a mobile phones then they would have it patented so only there phones can be used by human hands as they invented it,all other type phones would have to be worked using other body limbs and appendages. Mind you the apple phones would have poor reception still due to the hands on the antenas!! *sighs heavily* Okay, Apple, give us your best shot. Bring it on. Attack the consumers once more. Go somewhere else...? This patent is ridiculous, if you feel otherwise I recommend visiting a neurologist and having a brain scan done. Aso, its "your" you f**king idiot. The first. I love incorrect grammar correction corrections. ;) Can't help cc with his/her spelling however. AND the fact that it's "it's", not its.... whoa boy.. So do you say "it's" or "its"? English's not my native language, so i rely mostly on a few books that i've read to know how things are supposed to be written. It's = it is .. ex) It's chilly in Wisconsin. Its = possessive form of it .. ex) The *pple lemming has lost its way. i realize to you apple is god, and everyone else should just dissapear, but for once use the brain that has been sleeping between your ears. This patent covers any and all slide to unlock devices. 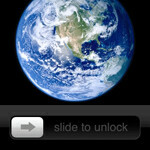 Slide to unlock has been around as long as touch screens, which is WAAAAAY longer than the iphone has been around. basically now apple can sue any touch screen device at any time no matter how wildly different the slide mechanism is. that is BAD. I realize you lack the mental capacity for deep thought, but suing everyone is bad. competition breeds new features. If it was only the iphone and they had noone to rip off..eerr... borrow ideas from, why would they ever make a new device? You would still be on the iphone2g.. 3g at best. Without competition there is no reason for them to invest in better tech, upgrade software, add new features like siri or android notifications. You have no idea what it is your wishing for.. zero. i wouldnt want any company to have that much legal power.. apple.. google.. the red cross... no one. Sorry Taco, I don't understand. Are you defending the USPTO? I said nothing negative or even untrue about Apple, so I'm assuming you don't appreciate my bias against the USPTO. Taco, if u truly believe that Apple is the greatest, then why bother trying to defend off all the trolls on the articles. If it was the greatest then people like you would not care because no matter what android should do, the iPhone owners will know they have the best out there. So why bother go to Phonearena if you "rich people" with iPhones are supposed to have real lives outside of a computer world. I'm glad Apple was granted this patent. I hope they put it to good use.